Our five most popular finishes are available to ship immediately in Black, Charleston Green, Medium Oak, Natural, and White. All other finishes are available in our special order section. 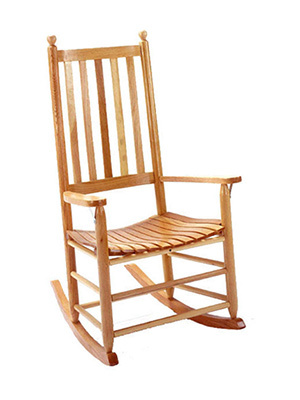 This popular shaker style rocker is a classic porch rocker and sits perfectly. The slat scoop seat has a double-scoop contour and the back has curved rails for comfort. Shown here in Natural Clear. Made of solid hardwoods in North Carolina and available in many finishes as well as unfinished. Normally shipped two per box. Shipped with the runners off, click here to download and read the easy attachment instructions (pdf). Shipped and delivered via freight truck. Please read our shipping terms and conditions. Don't see the finish you're looking for? Not enough in stock? Click here to special order.